Michael is a delightful man who has been passionate about music since a young age, and in spite of a life story with his share of hardship, has a remarkable approach to life and to the world in general. Our readers will enjoy his frank and passionate takes on various operatic subjects and on his life philosophy. Questions were by Opera Lively journalists Mary Auer and Luiz Gazzola. Proof-reading was by Opera Lively staff member Natalie Greenly. We thank the University of North Carolina - Memorial Hall for providing a quiet room for the interview, done on November 14, 2012, on the occasion of Mr. Spyres' performance in Chapel Hill, NC, as a soloist with the Orchestre Révolutionnaire et Romantique and the Monteverdi Choir, under the baton of Sir John Eliot Gardiner, in a concert featuring Beethoven's Ninth Symphony. © Opera Lively - Disclaimer: this exclusive interview is copyrighted by Opera Lively with all rights reserved, and is not to be reproduced without express authorization. Brief excerpts can be used after consultation (use the Contact Us form) as long as proper credit and a link to the full interview on Opera Lively are provided. Links to the interview can be posted without authorization. All photos were used with permission of the artist's manager, and fully credited. 2012 - 14, 16 & 20 November: tenor solo, Ninth Symphonie (Beethoven) - Chapel Hill, New York (Carnegie Hall), Costa Mesa, U.S.A.
Michael Spyres was born in Mansfield (Missouri), where he grew up in a family of musicians. He began his studies in the U.S.A. and continued them at the Vienna Conservatory. He was a Young Artist with Opera Theatre Saint Louis, where he made his main stage operatic debut as Rodolfo in La Bohème. After his debut at the Teatro San Carlo of Naples in 2006 as Jaquino in Fidelio, Spyres performed the role of Alberto from Rossini's La Gazzetta at the Bad Wildbad Rossini Festival and toured Japan as Alfredo in La Traviata. He returned to Bad Wildbad in July 2008 for his role debut as Rossini’s Otello. For the 2008/2009 season, Michael Spyres became member of the Deutsche Oper Berlin, where he performed roles such as Tamino in Die Zauberflöte and Steuermann in Der fliegende Holländer. Other important engagements in 2008/2009 were his UK debut in London as Fernand in La Favorite, his debut at the Teatro alla Scala di Milano as Belfiore in Rossini’s Il viaggio a Reims as well as the role of Raoul in Meyerbeer’s Les Huguenots at the Bard SummerScape Festival in New York. Important engagements in 2009/2010 were Bernstein’s Candide at the Vlaamse Opera, his debut with Opera Ireland as Roméo in Gounod’s Roméo et Juliette, Néocle in Rossini's Le siège de Corinthe at the Bad Wildbad Rossini Festival as well as Tybalt in Roméo et Juliette at the Salzburg Festival. In May 2010, Spyres performed the role of Ozìa in Mozart’s Betulia Liberata with Riccardo Muti at the Salzburg Whitsun Festival and subsequently in Ravenna. Roles in 2010/2011 included Tamino in Liège, the title role in Steffani's Antigono in Lisbon, Gianetto in Rossini's La gazza ladra at the Semperoper Dresden, Ramiro in La Cenerentola at the Teatro Comunale di Bologna and Arnold in Rossini's Guillaume Tell at the Caramoor Festival. In October 2011, he returned to La Scala as Rodrigo in Rossini's La donna del lago. Further engagements during the 2011/2012 season included a tour of Beethoven's 9th Symphony with John Eliot Gardiner in the UK and Germany, Candide at the Opera di Roma, Edgardo in Lucia di Lammermoor with Minnesota Opera, Masaniello in Auber's La Muette de Portici in Paris, Berlioz' Requiem with John Eliot Gardiner at the Saint Denis Festival as well as Baldassare in Rossini's Ciro in Babilonia at the Caramoor Festival and at the Rossini Festival in Pesaro. In 2012/2013, Michael Spyres will debut at the Liceu Barcelona as Hoffmann in a prestigious new production of Les Contes d'Hoffmann. Other engagements include (or have included) Faust in Berlioz' La damnation de Faust at the Vlaamse Opera, Beethoven's Missa Solemnis and the Ninth Symphony at Carnegie Hall, in Chapel Hill, and in Costa Mesa with John Eliot Gardiner, Orombello in Bellini's Beatrice di Tenda at the Carnegie Hall, Masaniello in La Muette de Portici in Bari, Verdi's Messa da Requiem in Porto, Leicester in Maria Stuarda in Washington, DC, Candide at the Vlaamse Opera and Rodrigo in Rossini’s La donna del lago for his debut at the Royal Opera Covent Garden in London. In the summer of 2013, he will sing and and record the title role of Guillaume Tell at the Bad Wildbad Rossini Festival. Some of his further future engagements include his comeback to the Rossini Festival in Pesaro as Rodrigo in La donna del lago, concert performances of La damnation de Faust with Esa-Pekka Salonen in Munich, his debut at Lyric Opera Chicago as Alfred in Die Fledermaus, Benvenuto Cellini in Terry Gilliam's new production at the English National Opera and a new production of Mozart's Idomeneo at Covent Garden. His Wigmore Hall debut is planned for 2014. Michael Spyres has recorded Rossini's La Gazzetta, and Otello for Naxos. Also for Naxos, Le Siège de Corinthe will be released in the Spring of 2012. Soon, he'll be recording Guillaume Tell. His first Solo CD “A Fool For Love” was released in September 2011. Available [here] for $17.16 at Amazon.com; a good CD in Luiz Gazzola's opinion. 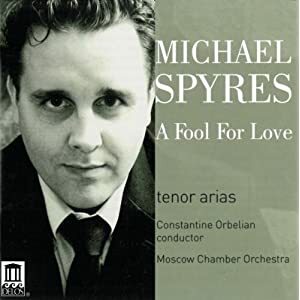 Fifty-eight of Michael Spyre's tracks can be downloaded as mp3 from the Amazon site in the United Kingdom, [here]. OL - The first question is that you grew up in a family of musicians, that you are named for your uncle who sadly died at a very young age, right? And couldn’t pursue his own career as a singer, so can you tell us about your background growing up in this musical environment? MS – Yes, definitely. In my small town [Mansfield, Missouri], we were the entertainment. My mother and father were my band, and choir, and drama teachers, and they switched back and forth in different years. If there was a funeral or a wedding, it was the Spyres family. We were basically the Hillbilly von Trapps… [laughs]. All of us sang together as a family from before the time I could speak. They had old recordings of me when I was two or three years old singing with my family and we just grew up that way. My parents [Eric and Terry Spyres] really instilled in me this love of music; music being a huge part of life and something than enriches you and helps other people in a very real way - not just in an abstract way, but in getting people together to sing in choirs. The town where I came from has roughly 1,400 people. My mother and my father didn’t know many people in the area, but they knew that they had music, and they knew that they were going to be the ones that people thought were a little weird, so they started making friends, and made them all join music groups and put on plays. They started this thing called the Ozark Mountain Players, and thirty of them would do melodramas three times a year in this small town just as something to get together and have fun. In a town that small, there are not a whole lot of social events other than Church, and a lot of time churches have a tendency to be rivals with each other [laughs], but music was one thing that everybody could agree that it is something that everyone lives with. People listen to the radio, and love to be together. My town is quite well known because there is a famous writer named Laura Ingalls Wilder, and she wrote Little House on the Prairie books and they are world famous, and it is wonderful because everywhere I go I tell people about it. In German I say, “have you heard of Unsere kleine Farm?” “Yes of course,” they say, and in Italian it is La Piccola Casa nella Prateria, and everyone knows La Petite Maison dans la Prairie, all of them, and I tell them, “well, that’s where I’m from, little Mansfield. “ When Wilder was about 27 years old she moved to the town and lived there for 64 years, and was a teacher and part of the community and wrote these books, and we still have this small house that her husband built for her, which lots of tourists come to see. My mother was a curator at the museum and she and her best friend wrote a musical that now has become quite a tradition; it’s in its twenty-second year. From when I was nine my whole family did this musical that my mother wrote together. My father and all of us helped build sets and we played instruments and sang and dressed up in folk costumes. We did this every single year for about two months out of the year and it was a fantastic way to grow up because I was always performing. We did sports, and music, and we were so active. When I went to college it was bizarre, because I started realizing, “wow, I don’t remember much of my years growing up because we were so busy.” I was having a chance to perform two or three times a month every single year, because when you live in a family that is that dynamic and full of music where everyone looks to you to sing in their weddings and funerals, music becomes very much a part of your life. OL – And what about classical singing, when did it come about, and operatic singing? MS – Well, my uncle whom I was named after, died when I was I believe one year old, and I grew up with this story of him wanting to be a famous opera singer. He was a bit mad from what I hear [laughs]; his only possessions were about thirty records of Enrico Caruso and Mario Lanza, and a record player, one chair, one table, a mattress on the floor, and a couple of sets of clothes. He would spend all of his money on voice lessons and trying to figure out ‘The Voice’. I still have his books and drawings and sketches and his ideas about singing. We grew up with this story, and my parents always had in the house so many operas! We loved music in all aspects but especially classical. OL – But the tenor gets the girls! MS – Exactly, but you live on the edge as a tenor, we don’t know most of the time if we are going to hit the right notes, because it’s really not natural to sing all the time in the passagio, but that’s how it is. OL – Listening to your CD "A Fool for Love," [Delos catalogue number DE 3414] I had the impression that the lower range is more comfortable for you. OL – So you started singing baritone. MS – Yes, for about three years. Well, when I started my studies I was eighteen. I went to school for two and a half years. I had a teacher – he is now an agent and a really nice guy named Robert Mirshak, and he was one of those natural tenors, a smaller guy who had this pinging tenor voice. My speaking voice was like this [makes it very low], so I thought “there is no way I’m a tenor.” And he said, “no, no, no, I think you can do it, I think you can try it.” He just helped me start thinking about preservation of the voice and direction and healthy techniques and all that, because before that I was just like any kid that doesn’t know. I knew about breath and I knew about diction and these things because I grew up singing so much choral music. My parents, being choral teachers, would talk about proper stance and vocal production, but to really go into classical singing, you have to learn first of all the old technique, the positioning, and you have to understand how the breath works with the tiny vocal chords. My teacher opened my mind up to the fact that the more effort you give, the less sound you produce, because the sound waves stay in your body, so you need to be as effortless as possible and be in the right position and let the sound go, let the waves go out into the audience rather than staying in you. Singing should be about the audience, and not about “this feels very good to me, it’s wonderful”. They are not going to get all the sound or feel good if all the sound waves are stuck in your jaw or your throat. It was that switch that started making me realize that I love to sing. For me it’s a form of meditation because I’ll want to sing for hours and hours a day. But in order to do that, you have to really, really concentrate, and think, “how much can I give and do I want to give?” Classical singing is not only about the love of music and what you are willing to produce; it’s trying to get other people to love the sound that you produce, and bringing them together. It’s a difficult balancing act because if you don’t like your job, the audiences are not going to like you, and if you like what you’re doing too much, they are not going to like you either, because they can see that you are only doing it for yourself. So there is both that kind of openness and holding things back emotionally in order to get the emotion to other places. It’s a really interesting flux of emotions that has to happen when a singer is doing it for the right reasons. OL – Let’s backtrack a little bit, and ask you a sort of psychological question. Could it be a burden for you as a child, to say, “OK, you’ve been named after your uncle who wanted to be a famous opera singer, now you have to make it, you have to succeed, you have to be famous” which you have done. But was it scary in any way, to have that fate, that mission put on you? Was it troubling? MS – It’s all in how your parents raise you. I took that on myself. My parents said “you’re named after him,” so there was some pressure, but there wasn’t anything that I really took on as a negative impact. It felt like I could do something that someone else couldn’t do, and I never even thought that I was not going to be a singer. I’ve always done many, many things in life. For years I was a construction worker, a part-time teacher, and a waiter, but while I was working in construction, people would ask me who I was, and I’d say, “well I’m an opera singer, I’m just working in construction right now.” “What, you’re an opera singer?” And I’d say, “yeah, yeah, I am, I promise you’ll hear me someday.” To me it was a really anchoring effect, because I wasn’t scared of the burden of carrying this torch with me; it was something of a goal to look forward to. My parents were really great. My mother and father come from absolutely different worlds. I came from this schizophrenic lifestyle if you will, because my father grew up very militaristically; everything was in its place, in order, very Midwestern, while my mother grew up basically a vagabond; she went to sixteen different schools. My grandmother raised three kids on her own, and my mother grew up in bars and casinos, and moving all the time. Seeing these two people come together and make it work, made me really realize that I can choose my path, and make what I want of it without them putting pressure on us. Neither of them ever said “you’re going to be a famous singer,” it was just something that I love to do and I took that upon myself as a child. OL – Do you have a clear recollection of the first time you attended live opera? MS – Yes, I was ten years old and I went to my mother’s alma mater, in Branson, Missouri. I got to go backstage and watch this university production of an opera. It was such a fascinating thing because it was what we were doing in our small town, performing for people, but with real costumes and an orchestra, so it was so amazing to me, and especially because I had been to lots of musicals in our area. I played Kurt in The Sound of Music when I was 10 years old, so I was able to sing with an orchestra, and I loved that feeling. But opera was something different; to me it was the height of music. I think that’s what opera is: the collaborative height of dance, acting, singing, all of the arts put together in one, and you rarely get that chance in life to bring it all together, and that’s why opera is so important. Unfortunately singers get all the glory, but we are nothing without the others; we may be a very strong arm, but there’s a huge body we are connected to. OL – So, let’s talk about training a little bit. You went first to a school here before you went to Vienna. MS – Yes, I went to a school here in the States at MSU, Missouri State University, in Springfield, Missouri, and I had this voice teacher for two and a half years., My choir conductor there, Dr. Guy Webb, is a very prominent choir conductor and he is an amazing singer on his own right; he went to Juilliard back in the Forties, and he conducted in a style that matched how he would sing. He would stand in the perfect position, and go oooohhhhhh [sings] when he conducted, and you would see this perfect model while he was conducting. Then my voice teacher was telling me all of the things that I was asking, like “why does my voice go ahohahohah? [sings with unstable pitch] on this part”? And those two people taught me so much during the two and a half years that I was there! I just couldn’t stand being in a university anymore, because all I wanted to do was sing full time. I didn’t go to classes except for music; I just sang for six hours a day, I’d go to the rooms and just sit there with a piano. The Tenors’ Greatest Hits Book has some thirty arias, and I would make it my goal every day to sing through every aria. So I was singing lots of inappropriate things, but still it taught me something so interesting. Every repertoire teaches you about your voice, because almost every piece was written for a different singer, and was written for the strengths of the singer. It might not be right for you on stage or anything, but it will teach you completely. When you are twenty, nobody should really be singing heavy Verdi or Puccini or Wagner, but you should sing through it order to learn about your voice, and realize, “huh, that’s weird, it makes me sing higher in a different way than I use for Rossini or Mozart,” so you have to switch your technique around. Anyone who says “technique is technique” is being too close-minded; you have to change your technique slightly for every composer and even every role. With certain composers, especially bel canto, it is not extremely high tessitura. Most of the time it lies quite low, but then you have floating melodies, and it doesn’t stay with E, F sharp, G, as a lot of the dramatic repertoire or say Mozart does. Switching back and forth teaches you so much about your instrument, and I find that it is such a pity that so many people stick to just one form of repertoire. Pavarotti only did a few roles in his entire career and he was amazing, but if you read his bio, for literally years, all he did was work on sounds, work on vowels, work on vocal production, thinking all the time “what am I doing here, ah ha ah ha, oh, that’s what I’m doing”. I think a lot of singers unfortunately get into this groove of going to a teacher, and then finding the next teacher. It’s great to have teachers with good ears, but most of the burden should lie within ourselves to figure out our instrument. Most singers, because it’s so scary, won’t take on that responsibility of doing all the research, reading all of the old books, figuring out why techniques have changed, why people were writing in a different way before Caruso, and why audiences liked the style – that of Jean De Reszke, for instance - rather than the visceral high C from the chest. Thinking about those things is what I do in my days; I’m obsessed with sound, so when I hear a bird or a squirrel, I wonder how their vocal tracts work, I think “ta,ta,ta,ta, does that work for me?” I put all these things in the context of fascination with sound and instrument; I think that’s the most important part about singing, and especially about technique. OL – You had Dr. Webb and Dr. Mirshak, right, and then lately you haven’t been working with a voice teacher; why is it so? It’s a bit unusual, among the people I talk to, so, what made you go solo on the training lanes? MS – Well, when I was twenty-one, I quit college when my teacher moved away to New York. Then I realized, “I’m going to have to do this on my own,” so for five years I really didn’t sing anywhere. I was just doing odd jobs, and I was involved in this choir called The World Youth Choir, and that was about the only thing that I did. It’s a choir that meets once a year in Europe for two weeks and then performs, so in those five years this was about the only singing opportunity that I had. The rest of the time I was thinking about technique, and thinking solely by myself. Then I went to Vienna, I did auditions all around, and I was accepted at the Conservatory there. It was great, because I didn’t have to do a lot of the course work. I was twenty-six, and they needed a tenor for the opera studio, because tenors are scarce everywhere, and fortunately I had the technique to sing a lot of things, so I got to perform. The conservatory in Vienna really shaped me into a more well-rounded singer. I already had a good understanding of vocal technique, but all the diction coaches in the conservatory, who also work in the Staatsoper and the Volksoper, gave me invaluable coaching. Even though they were not giving me voice lessons they were giving me vocal technique, they were teaching me about phrasing and shaping. Having a lieder teacher really helped me understand the intimacy of sound, and realize that singing is not about shoving as much sound into an audience as you can; it’s about making them perk up and want to listen to you. OL – Was Vienna before or after you attended the Saint Louis Young Artists Program? MS – That was after. Saint Louis started when I was twenty and went on for two years. My first Rodolfo was at twenty-two, yes [laughs], and it is still a tough sing, actually. But I was fortunate because I got to start with Saint Louis. The people there are incredible; it’s a really high level of artistry. I was fortunate enough to work with Stephen Lord as well as the late Colin Graham. The amount of really, really good art in Opera Theatre Saint Louis was invaluable for me in the two years I was involved with their young artists program. It broadened my mind about what it means to be an opera singer. OL – So that was simultaneous with your college period? OL – And then, was it a difficult time between twenty-one and twenty-six? MS – Yes. Definitely. [laughs] Very much so, because all the burden was on me to do what I said I was going to do. I was so fortunate, because my parents let me move back to their place rent free and they had a great piano and I would come back after work and just sing until one or two in the morning, and they wouldn’t care about how much sound I made; because they told me that they knew that I was going to make it! OL – And so, how did the decision to go to Vienna come about? MS – It came about because of my ex-wife who was a singer as well – she is Serbian. She and I knew that we couldn’t live in Serbia and we couldn’t live in the United States, because we didn’t know anybody in New York or Chicago and because of visa situation, it was very difficult to find a place to live. We thought of Europe because we had a few friends from our World Youth Choir days; that’s how I met her, and we went and auditioned for four or five different places. Fortunately we had friends from the choir in Vienna, and they said “If you come to Vienna, I’m sure you can get into the Conservatory and you can also get into the Arnold Schoenberg Choir,” because I was so used to choral music. So while in Vienna both she and I sang in this wonderful choir, and that’s how we were able to make enough money to live on. OL – For how long did you stay in the Vienna Conservatory? MS – I believe it was two full years. OL – So what happened next? OL – That led you to your La Scala debut, right? As Belfiore in Il Viaggio a Reims. OL – By the way, I love that opera. It’s not really an opera, it’s more like a showcase for the singers; it’s like a concert because there is one aria after the other, after the other, one for each singer. MS – Yes, exactly. He wrote it to have a good time and just for people to get together and show off their talents. They all come together and make fun of each other and they are all having a good time. OL – So this is a very good debut because it gives you opportunities to show yourself in that setting, right? OL – So, then you did Arnold in Guillaume Tell, then the comedies, so you started with Rossini. However you do have some thirty-five roles that you’ve sung, and you’re working on getting to forty-nine, huh? MS – Yes, exactly. The last one I did was La Damnation de Faust, that’s actually my forty-fifth role, including character roles, all together, a lot of them in these past 7 years. But I had a great situation being from Springfield, we had the Springfield Regional Opera, and by the time I was twenty-two I already had six roles under my belt, because I was doing small parts in this regional opera company. When I moved and talked to friends in New York and Chicago, they said “Wow, this is really rare, you had a local opera company and you got to perform in it?” Most of these friends at twenty-five had never even done one role, while I was able to have stage time in that small environment. I loved it in Springfield because we had an opera, and a ballet, and two symphonies and two chamber orchestras. I think there are twenty-two different theaters in a town of a hundred fifty thousand people so there is a lot of art going around. OL – So I hear that in European houses these days it is easier for them to hire Americans and Eastern Europeans, than the local people. Because first of all they think Americans are very well trained, and second, since the end of the Cold War the Eastern Europeans are coming in force. Did you have more facility with your career in Europe? Because it’s only now that you’re coming back to the United States. Can you tell us a bit more about this conundrum? In the past that’s what people pretty much had to do, they had to go to Europe to train. But then we got our strong conservatories and universities, and regional opera companies… I think we are pretty much a force in the operatic world, now. OL – But still, the Europeans have the tradition. But we might say that you are on the other side of history, right? OL – Can you tell us a bit more about all that? MS – Yes, definitely. One person that I like to quote a lot is Jonah Lehrer, a young neuroscientist, who gave a speech about the virtue of being an outsider, and to me that has been an incredible help, being an outsider, because it forces you to look at all of society and what you are doing in a different way. All my friends and people I grew up with said, “OK, if you are going to do opera, you need to move to New York, or move to Chicago or Seattle or San Francisco; there is only a handful of places, maybe five, that you can go to, do your studies, and then get into the opera world and make a living.” But in Europe I saw all this opportunity; Germany alone has something like three hundred opera houses, compared to ten big houses that everyone is trying to get into in the United States. I decided I was going somewhere where I could wait, because I knew it was going to take a while, and I really needed to learn languages, because when I moved there I didn’t speak any languages whatsoever. Because of my skills of imitation, I could sing and had good diction in four languages, but I didn’t understand a word of what I was singing unless I would write it down. Now I speak four languages, just because of being immersed in the society. For me it was just a logical decision. Going back to what you were saying about US singers, they have to work harder than the European ones, who are singing in their own language. In the US there are so many really good singers, and it is really hard to get work here. When you go to Europe you’ve already had the training of the schools and the professionalism which is the most important thing that is taught here in the US. Every US person that I sing with in Europe, we are usually looking around and saying, “How do people show up for rehearsals and not have their music memorized?” Especially in Italy people are used to someone teaching them the role during rehearsal periods. And it just makes no sense to me, but that’s how it was, that’s how the system used to be set up; you would have six months with a maestro, and the maestro would tell you about tempos, and talk about meaning and so on. Now the world is going faster and faster, and with the US and Eastern Europeans and also all the Koreans and Chinese, all the jobs are going to the people who want them more, and really feel that they need to make it. Like any job market, the people who are the most qualified get the jobs. Sometimes unfortunately you are not exotic enough. That’s one of the problems that I was having, I would do auditions and I wasn’t getting much work, and I didn’t know many people. OL – Do you mean here or there? MS – Here, here. So I moved to Europe and it took me a couple of years, but people said “Ah, the American kid, yeah!” I’m an exotic person over there. Europeans come here, and a lot of them are getting work if they are well prepared [laughs], but they are getting work because they are exotic, and it’s just that people like this exoticism. OL – What would you say to young singers, what advice you have for them, for someone who is coming up the ranks? You had this unusual path but you made it. I guess it’s not the wisest advice to give, to tell them to follow this unusual path. I’d think it was harder for you to make it through this convoluted path than for most people, so what do you think people should do these days, when they are starting their undergrad studies and thinking about operatic singing? MS – I don’t know, because for me it just seemed logical that in order to make it in any business you have to be really good at what you do and really well prepared, and the burden is going to be on you. Definitely universities and singing teachers are very important, but out of the forty or so young artists friends that I had at Opera Theatre Saint Louis, there are 5 or 6 that are making a living singing to this day, and that’s only been ten years. The main problem is that when people get into this mentality of “I’ve got to follow this path in order to make it”, it closes in their idea of what making it is. I had to give up a lot in order to be in this position. I had to move to Europe with the money that I was given – a thousand dollars, and a suitcase. It sounds like a cliché movie but I was willing to give up everything, go to a society where I didn’t speak the language and I didn’t understand the culture. I knew I needed to learn languages so that’s what I did. For younger singers, they need to be willing, to understand what it means and what they really want. Do they want a life of being a star? It’s just like people who want to be a politician or an NBA basketball player: about one percent make it in the world. That one percent that does make it, they are the ones that are truly obsessed with the singing, obsessed with music. MS – Yes, driven, exactly. They are really driven. And a lot of people do it for the wrong reasons. It takes five years before people either give up, or they don’t [laughs]. It’s all about analyzing why you want to go into music and especially singing. If you are doing it for the love of it and for the interesting cultural aspects of being able to see the world in a different way and expanding the mind and trying to make the world better, do it. But don’t go into opera thinking that you are going to make a lot of money and be a star, because stars fade, stars go bright and just die out. If you really want to look up to someone who is very important, to me it was Nicolai Gedda. He had a singing career for sixty years, and he started out as a banker, and did all of the work that you are supposed to do. Everyone thinks that you are supposed to get famous when you are in your twenties and have this great, great career. If you look statistically at what happens, same as in any professional sport, people do it for about three or four years then they start to get worse and worse and worse, because they are not doing it for the right reasons, for the love of the game, or the love of the arts. What I would say to young singers is “you have to get in your mind that you are a singer. Even if you don’t have work now, you still have so much work to do”. By the time I’m sixty I hope to be fluent in ten languages. It’s just constant learning, constant openness to change; that’s what an artist is supposed to be. OL – Thinking of Gedda and his sixty years of career, and Domingo going for more than that, probably, do you worry about your own longevity? In terms of all this diversity of roles, and your start with choral music, are you worried about damaging the voice? MS – I’m not, personally. Of course one always thinks anything can happen, which is true [laughs]. But look at singers, people like Jean de Reszke. That’s what made me realize, “Wow, you can do lots of varied repertoire and be quite successful, but you really need to be really smart about it.” Some people argue that de Reszke was one of the singers who did the voix mixte a little too much, but he was able to have this really wonderful career, and I remember looking at a Met log, and Jean de Reszke was doing Rossini and Wagner and Bizet all in one week, and people were thinking, “what, you’d never do that.” No, you would, and that’s what keeps my voice really intact. Because if you stay in one way of singing and only do Wagner, only do Puccini, only do Rossini, you really start getting lazy. I think you need to have this very varied repertoire in order to have different vocal positions and think in a different way. The more varied the repertoire, the better you understand your instrument, because you are forced to. That’s how it’s been for me. OL – So now you’re moving to light Verdi roles such as Alfredo, and the Duca, and you’re about to do Hoffmann in Barcelona, right? But interestingly enough, you are preparing for Oberon, which is a part that is usually for a spinto or a juvenile dramatic tenor, right? MS – Yes, I did study the Opera "Oberon" and was preparing to perform the young lyric role of Huon and not the darker more dramatic Oberon though. With Oberon there is the darker, older tenor who has the more dramatic voice. Unfortunately now a days people usually do not cast the correct voice types for the voice it was intended for. [laughs] When you are doing obscure repertoire it costs so much money to put these productions on. You need to get the top of the top. Usually you need to get someone who is going to really excite the ears and unfortunately most of the time this means this loud dramatic spinto kind of tenor, even though most spintos now aren’t true spintos. For me Aureliano Pertile was one of the greatest singers of all time, because if you listen to his voice he had this massive instrument - people said it was the biggest voice of all time - but he could sing pianissississimo – you could hear the control that he had. I just can’t even think of a spinto who is singing now who can actually sing dynamics. And that’s the tragic part: so many people are so focused on sheer volume of sound that they are not realizing, “no, no, no, you don’t need that much sound all the time.” Everything is turning into a mezzo-forte to fortissimo. Dynamics is something people have forgotten about. OL - [laughs] If you can’t tell the difference between your car stereo and the live opera experience, you shouldn’t be there in the first place. OL – What are you doing there anyway? OL – Right. I’m learning from what you’re saying, and I think I can now understand the experience I had yesterday. I was introducing opera to one of my Psychiatry students, because I think opera is a great tool for Psychiatry, actually, because it touches the human experience all the time. So I was telling my student about several singers, and told her that on Opera Lively we voted Waltraud Meier as the best current singer from the technical standpoint, among all singers who are currently active in opera houses. The student wanted to listen to her singing, and I played a video clip of the “Liebestod.” There was this huge Wagnerian orchestra with this huge sound, and Waltraud was cutting through it, without being louder than it. She was piercing through it. I was myself mesmerized. I had goosebumps. I wanted to demonstrate to this young person Waltraud Meier’s singing, but I got the full impact myself, I thought “Oh my God, how does she do it, how does she weave through this huge sound of the orchestra?” We could hear her crystalline clearly, but she wasn’t shouting or anything. MS – Exactly, and that to me is the mark of a great singer. Same thing with one of my colleagues, she unfortunately passed away last year, Liza [Elizabeth] Connell, she was one of the greatest singers of all time, and people need to know her name if they don’t already, because she had one of the most varied careers ever, and she was the height of technique. She started out as a contralto and ended up as a dramatic soprano which is very much in the opposite order that most singers tend to go. She sang for over 40 years moving into all different types of repertoire and she was singing Turandot very healthily just last year when she was sixty-five. I was fortunate enough to be the last person to sing a duet with her on stage. Though it’s not the right repertoire for me, I did Verdi’s Otello duet “Già nella notte densa” and she was Desdemona, and despite me being a true lyric tenor and her being a dramatic soprano, we found a way in order for our sounds to blend and find that place that is tasteful. OL – Where do you see your voice going? I was thinking about this Oberon. There is Der Freischütz – Max might be another one of those, right? What do you think you might be singing next, and what are your goals? OL – This is one of my favorite operas. MS – For me too. Fortunately enough I just sang it in this revolutionary production with Terry Gilliam as director, but French repertoire for me specifically is that right balance of dramaticism coupled with intimacy. I think it’s probably also because I love the times when people didn’t have a set idea of which era they were in, and so for me the 1830s into the 1860s people were composing and trying all those things out. I love that period of writing like Auber, and Meyerbeer; and Berlioz was the end of that period when all of those people were doing these amazing different things with orchestration. Wagner also is absolutely incredible. Wagner wrote these huge long phrases and these beautiful melodies, and people think you have to have a gigantic voice to sing Wagner, but that’s absolutely untrue, because if you ever go to Bayreuth about half of the orchestra is covered up and it’s all about the blend and gravity of sound and the effect, and not the sheer volume. That’s the one thing we have to start doing because it’s detrimental to audience’s ears, and singers’ years of singing are cut short simply because everyone thinks that the audience wants volume, so we better give them what they want. No, no, the audiences want to have their hair stand up, to become alive and see something that is going to change their lives. One of the most maddening things to me is that people aren’t putting things into context. We go to a competition, you’ll hear some of these incredible voices and they sing wonderfully two arias that will blow your mind, but when you see them doing an entire opera after an hour it’s the most boring thing in the world. You hear it come out and you think “wow!” and then five minutes later, [sighs] “so boring, so boring.” It’s all one sound. People aren’t being artists like they should, because we are all trying to give people what they want rather than what the composer wanted. We need to get back to why the composer wrote something in a specific way, and we need to get used to the fact that people think differently now, but there is no shame in going back and realizing that “Oh, maybe there is a reason that Verdi wrote the B flat at the end of ‘Celeste Aida’ triple pianissimo, and it’s OK to go into voix mixte, that’s why he wrote it, he was so specific.” But now you hear everybody sing triple forte, because, “Oh, the audience wants to hear something loud.” It’s making all of us dumber for not willing to follow the composer’s wishes. OL – Well, we interviewed Dr. Philip Gossett from the University of Chicago. OL – Yes, wonderful. And he is working a lot on this, trying to restore the right dynamics on the critical editions and trying to see that people pay more attention to what the composer wanted. MS – Yes, I’ve been fortunate enough to work with him three different times, actually. When I did my debut at La Scala in the Viaggio a Reims, he was giving us ideas and helping us especially with cadenzas and things like that, and then I worked with him again in Chicago when I did Rodrigo, the smallest part in Verdi’s Otello with Muti. There is a reason why someone like Muti is up there, because he pays so much attention to detail and he won’t let anyone get away with things and he’ll just start laughing at you if you are singing forte for no reason. [Unfortunately we interrupted him and he didn't tell us about the third occasion]. OL – OK, let’s talk conductors, we have one of the greatest right here, right? John Eliot Gardiner. How is it, to work with him? MS – It was quite nerve-wracking the first time I auditioned for him, because he is one of those legends that I grew up with, along with Riccardo Muti and Alberto Zedda. Those three guys were the pinnacle of conducting, and they are all very different, but there’s something about them. When I auditioned for Gardiner for the first time, he was so down-to-earth, and very intellectual, and he put me at ease, because he wasn’t unimpressed, he was staring me in the eyes, going, “Hm, I like what you’re doing, it’s really interesting, but let’s try something else, see if this works.” I really enjoyed working with him. He is very meticulous and very adamant about musicality and doing everything for a reason, and he has the capacity to do it. Some conductors don’t. Some conductors are doing conducting just for themselves. And you can tell – “look at me, everybody look at me!” But he is just like what a conductor should be, looking at everything and hearing the whole sounds. The main part of a conductor is making sure that music is flowing in the proper way and that art is being made. When you hear Beethoven’s Ninth a million times, there are some good recordings out there, but to come and hear him and be able to sit there and watch the rehearsal like we just did, I was just on the edge of my seat listening to how every single phrase, something that you’ve heard a hundred times, can be made new. When you have a true artist at the helm of the orchestra and it’s never exactly the same, that’s the great thing, it depends on a gesture, it depends on the feeling, but it’s always based on what is written and the phrasing, and that to me is the mark of a great conductor. MS – Yes, a marvelous orchestra. OL - … and he also said, “You know, I don’t think we really need to be doing all this soft sound and so forth because there is a place for the full modern orchestra as well.” [We are paraphrasing] Now you are doing the Ninth with a period orchestra. How do you position yourself in this discussion? MS – I think there is a time and place for everything. This orchestra is perfect for this sound. We are doing original tuning in A430, so that’s a little hard to get used to, because when you are used to singing everything in 440, you have to be slightly flatter than you normally would, because it’s not a full half-step. It’s just a little bit more rounded. Yes, it is quite different, but I absolutely love it, you just have to take things into context, because with the modern orchestra the problem is that it is this exciting huge sound and people forget that “OK, there is this huge amount of sound coming out so I need to be delicate but broad and grounded.” The problem is that a lot of people are either or, and I’ve never been one of those persons, I’m either and or. I like to have the full spectrum of everything. It depends on the hall, that’s a big thing. I’d love to hear this orchestra in a massive hall. You do have to watch for and listen differently than you would with a big orchestra, but I think both sides need to realize that there’s enough music out there and enough places to have both. We live in modern times, I have a lot of scores, and all my music is on my Galaxy tab, and I do all of my learning from it, and I have so many friends who say “No, I just can’t get used to electronic music!” Why not? I have both. You can have this rich existence in both sounds, both orchestras, and it is not that controversial. It just got to be right. Maybe you’ll not like the sound as much but you can’t deny the beauty of old sounds. Today we were having a problem with pitch a little bit, because some of us singers were realizing that something is wrong, because the orchestra is in front of us and we are not hearing their pitch at 430. What we are hearing is the sound that is bouncing off the walls and coming back to our ears, and we are hearing something that is slightly different, because we are behind where the sound is. Sometimes just because of aesthetic purposes you don’t want the singers to be all singing in front, but it’s almost physically impossible. [laughs] But one aspect that I really love about John Eliot is his ability to realize that choir, singers, orchestra, conductor, we are all one body. So we are not more important than the orchestra, the orchestra is not more important than him, he is not more important than anybody else. He is the one who is keeping us all together, but he doesn’t have such a massive ego that “Everyone watch me at every turn” – all of this is a give and take and a realization that we are all working together and that’s what I absolutely love. OL – About stage direction. I read in one of your interviews that you like very much Thaddeus Strassberger, right? OL – And we’ve just interviewed him too. OL – It was one of our most spectacular interviews ever. I really loved him, and I went to see one of his productions, Le Roi Malgré Lui. MS – Oh, you did, at Bard? Great. I just saw some of the production pictures. We talked about it, yes. OL – Great. But you are mostly based in Europe and America is a different place. I was just talking to Maestro Meena from Opera Carolina, and they had over there this beautiful, visually striking staging of Madama Butterfly, with a production by Katano, a visual artist. And Maestro Meena told me that they had to do a very traditional Tosca because a lot of patrons complained about the Katano production, and I found it so incredibly beautiful! His patrons said, “Oh, wait a moment, we don’t want, we don’t need this!” The next production, they had to go back and rent very traditional sets for Tosca. So there is a difference in culture. Here we have some trouble accepting the novelty of Regietheater and all that, right? Personally the jury is still out for me. I like some of those director-driven productions, but some I think go a little overboard, over the top, so what do you think of this? MS – Yes, I’m of the same nature, I love everything that is well thought-out and well presented. The problem is when someone is trying to do a revolutionary production and a lot of time they aren’t taking into consideration the demographics and the likes and dislikes of a community. If you are going to do something really inflammatory, it’s your job also to educate people, to go out there and hold extra conferences and talk to the donors and the people and say “this is why it is so important and so crucial that we do something different, because this is what opera is about.” For instance, in Vienna most of the time the productions are of an older nature but when they did this Don Carlos that I got to see a couple of times with Ramón Vargas, the French version with five acts, it was funny because it was semi-traditional and then they had little parts that were newer and set in the fifties, they had a little Hausfrau and the people were so enraged and yelling and booing about the production. But to me that is the core of opera, it should be this revolutionary thing. You can’t make everybody mad because you still need audiences and you need money to come in, but to me that’s why art is so important; it should be this revolutionary thing that just gets you mad and you start talking about it, like “That was total crap”. After you do that, if you really care about your project, you should have question-and-answer situations, and if people are really mad at you, you have as a director to be able to say, “Well, I see your point, but the reason I did this is because I thought that the traditional values have changed.” You just need to have a discussion. Most people want to see operas with people in traditional costumes like in the movies. I’m all for traditional opera, but I don’t want it to be stale and boring. Some composers have written really time-specific operas, and that’s a hard stretch to do, but I have no trouble with newer productions, it just has to be presented in the right way. These revolutionary ideas are what everyone is after, but some people are just not subtle enough with their ideas. Calixto Bieito is the height of what people do not like in the States, and with a lot of his productions, I think they are a little too… in your face for the wrong reasons. I enjoy the thought process that goes along with it, but I think a lot of directors now aren’t musicians, and they are not taking things in consideration. Thaddeus was amazing, because he wasn’t himself a musician, but he started realizing, “Hmmm… why can’t the singer do this? Maybe there is some kind of technical reason, so I’ll let them do that, but they want to move here, so…” It takes so much thought in order to make everyone happy, and I think especially Thaddeus, and Terry Gilliam did an amazing job too. With him at first it was a little difficult to get him to understand the concept of opera timing. If you are singing [sings] “I looooove youuuuuu” and you want this big gesture to come out during “you” he would get all upset and say, “no, no, that’s not visceral enough and I need you to say I love *you*” and we’d say, “OK, you said that, and I do believe that, but there are six seconds of music between the action that you want, and the next word; we can’t do it the way you want it…” and he’d say, “wow, I see what you mean”. The action and build-up to the climactic moment takes longer and is more drawn out in opera than in movies or other mediums. You need a director that is really taking everything into consideration, especially all of the words. I’ve worked with some directors who are working from a translation, they don’t even know the original language that they are trying to direct in, and sometimes you say “Huh, I can’t put my arm up here because there is absolutely no reason for me to do that, because I’m trying to say I love you” and they’re like “Oh, huh, I didn’t know that.” There have been many cases like that, because people get so driven on their own idea of their revolutionary thing, the concept they think the whole thing is going to fit into, but they are not taking the composer’s wishes into the context of their new brilliant idea. The successful directors are those who have a real broad aspect of what an opera is supposed to be, while still catching all the things that the composer wrote specifically for it. I don’t think that there is anything wrong with modern stagings, in fact that’s what is going to propel opera into the next level in the future, because I don’t think that opera is this stale form of art. It’s just that we don’t have many ambassadors that are willing to say “OK, opera needs to be revolutionary, but very well learned and traditional in that sense,” and people have a hard time taking new and old ideas and perpetuating them. It’s either… “No, I like it how it always has been” or “No, I want something crazy and new and different.” There is a way to get it all in there; you just have to be really sensitive. Most directors, though, can’t be bothered to put the time in, because we live in the fastest world. What I think that is going to be really interesting is newer technologies, especially electronic projections. They’ve done these art installations in different places in Europe. The first place I was aware of it was in Berlin, but I got to see it live for the first time in Barcelona. There is this new type of projection that they started to put on outside Gaudí’s house, they turned it into a movie screen. They had really good sound and really good projections. So the house came alive. The house was singing to operatic music. OL – That was a production of what? MS – It was just an art installation. They were doing just art for art’s sake and it was only a ten-minute thing, but this got me really excited thinking of the possibilities for opera. It’s already hard to be a singer with all the art you put in, and now you’ll need to do the same thing with these new technologies. I had a fantastic time doing this Baroque opera in Lisbon, Antigono by Antonio Mazzone. It was the first time it was being performed since the great Lisbon earthquake back in the 1700s. We wanted to do it very traditionally as far as staging went, because the music was just so absolutely hard, it is one of the hardest operas. The old Baroque way was to come out and stand there and really sing, and there wasn’t so much action, but the great thing is that we coupled this with a very good visual artist who was working with us from a digital pad for the two weeks we were rehearsing. He was drawing in real time the entire set, ideas for the background, so while we were singing he was projecting what he was drawing and you could see him right next to the conductor just watching and feeling and moving and creating art at the exact time, and making flames shoot out from people’s heads, while we were standing there and singing our hearts out. 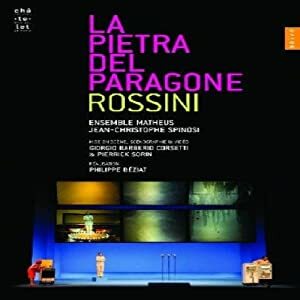 OL – Have you seen the DVD of La Pietra del Paragone with the blue men and the pancakes flying? MS – Yes, yes! Of course! I just think there is room for it. People just need the education, they need to understand that this is the only way they are going to propel opera to a newer generation, because I’m sure you know in your profession, people’s attention spans are getting shorter and shorter, and you need to get the endorphins to come out faster. The amazing thing for me is that the more you can educate someone, the less they have to have instant gratification and they can start to read. Our brains work differently when we read books and excite parts of our brains, and we can put the brakes on a little bit. With classical music and especially opera we can have the best of both worlds, we can have the open, crazy, in-your-face kind of moment and after a couple of seconds you need a little downtime and not everybody is going to be exactly on the same wave length, but there needs to be variation, just like with the dynamics we were talking about. There also needs to be dynamics in acting, because there is so much acting involved in our newer operas that people are forgetting that there are physical limitations. If you want to have a really good sound, that pure, pure legato, you probably shouldn’t have your singer doing cartwheels or having a physical fight. There is a way to do it, but it is not going to be exactly correct, if you have someone fight while singing [sings], it just looks awkward. [laughs] Most people are just not willing to put in the time. OL – What about contemporary opera, any interest there? We were talking about projections, I was thinking about an experimental opera I saw. 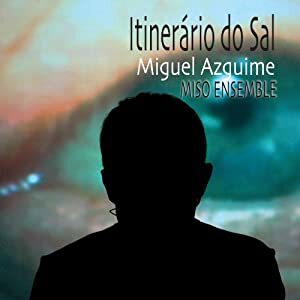 It’s hard even to call it an opera, it’s more like electronic percussion / visual effects musical theater with projections out of a pad, by a Portuguese composer called Miguel Azguime, it’s called Itinerário do Sal, I don’t know if you saw that. MS – No, but I have friends who told me about it. OL – So, that is very radical, but I loved it, by the way. Then you have the famous machine by Robert Lepage at the Met for the Ring, have you seen that? MS – No, I haven’t seen that yet. OL – Because that is also controversial, with all the use of technology, what does it do to the staging? I thought that the stage was a little cramped and the machine didn’t give as much space for the singers to act. I value blocking and dynamic use of space a lot. MS – If you noticed that they don’t have a lot of room to act, that to me is the same situation of directors having a beautiful idea which is not working out in real life because they are not realizing that the most central thing about opera is human expression. It can’t be just about one centerpiece or how amazing a mechanical arm is; it has to be the assimilation of humanity and technology. Most people go with one idea and they don’t take things into consideration. OL – But let’s talk about true contemporary opera. Any experience singing it, or plans to? OL – You are getting back to something you’ll probably enjoy a lot, Die Fledermaus, because with your family background in musical theater, are you looking forward to the operetta genre? MS – Yes, very much so, and also because when I was in Vienna, I did a lot of tourist concerts, and I had to sing a lot of operetta. It was great for me because operetta has its own specific style. A lot of people don’t quite understand the double entendres that have to happen, especially with the language, and fortunately in Vienna the operetta culture is still just really vivacious. The Volksoper is always doing operetta. For me it’s a charming moment in musical history and I love it because you can be funny and romantic and it is all a little bit more lighthearted. OL – I would assume – I haven’t had the pleasure of seeing you on stage yet – that you are a good actor, with your background, right? MS – Yes, I love the acting aspect. That to me is just as important as the singing, because if people just want to hear a voice, let’s just do a standing recital. This is opera, it’s alive, and you are supposed to use your entire body. For me that’s why this operetta is going to be so much fun, because I love acting, I just love it. OL – Combining the French repertoire with that, maybe you’ll want to do the operettas by Offenbach, not just his Hoffmann. OL – La Belle Hélène. OL – I’d like to end with two aspects. One is your CD. I actually have it here and will ask you to sign it for me. OL – I have one small criticism to make of the track selection. OL – Because I see all this incredibly diversified background that you have, and I thought you were not as adventurous as you might have been, when you selected the arias to include in your CD. And of course, it’s your first one and you need to really place it, and people want to hear those famous tenor arias. But do you feel that you’d want to go off the beaten path for a future one? OL – Just listening to you and noticing your background and the way you were driven to succeed and did so many interesting things, you seem to be a happy man. I’ve talked to many singers who love the art form but feel very burdened by its demands, to be on the road and in hotels all the time, away from family. It looks like you found solutions for this. You’ve remarried, your wife is a singer as well [Tara Stafford-Spyres], you go places with her, it’s probably less hard on you, although I’m guessing a lot here. MS – Yes, I’ve been through a lot of things. The funny thing is that people say, “Wow, you are so upbeat” – that’s why Candide is truly my path; I love Candide, because I came from this small area and then I got to see all of the world. From my diverse background in terms of my mother and father, I was forced to not look at the world through one eye. A lot of people end up doing that, it’s just human nature, we only go to places that we want to go, and my parents forced me, because of their different backgrounds, to constantly go into places and situations that were going to be difficult. I don’t really revel in that but I know that there are certain things in life that you have to go through, like love, and loss, and moving to a place to where you’ve never been before, and seeing new cultures and being an outsider. Being an outsider is such an interesting thing to me, because it’s helped me realize that the world is much more open and a loving place than a lot of people give it credit for. Of course we can’t control the world, but… my mother has a really great saying, that you can’t carpet the world but you can wear slippers. That’s truly my belief too in life, that you have to protect yourself for the long haul, but only in the last couple of years I’ve found this balance of happiness, just simply because I started looking at my life and seeing all the mistakes that I’ve made in the last ten years, personally and family and all of these things, and I started to wonder if what I really want out of life is just trying to get famous and just trying to do this job? What am I doing? And fortunately once I started to question everything I started to say, “Wow, I’m getting more and more work, now that I’ve become more comfortable and happy,” because everyone wants to be around people who are nice and happy. OL – I guess we shouldn’t spoil this great answer by following it up with something else. MS – Thank you so much! Are you going to be able to come to the concert tonight? OL – Yes, I will. MS – Wonderful! It will be an amazing experience. Tara and Michael Spyres perform together in a 2011 Springfield Regional Opera production of La Boheme. If you came to this page through a link from another site, please consider exploring our other exclusive interviews (Anna Netrebko's, Joyce DiDonato's, Anna Caterina Antonacci's, Luca Pisaroni's, Thomas Hampson's, Piotr Beczala's, scholar Dr. Philip Gossett's, veteran singer Sylvia Sass', and stage director Thaddeus Strassberger's are especially good, among about 70 artists), news, and articles by clicking on the Articles tab above and using our new clickable content index [here], or the Section Widget on the top left of the page; our very active discussion Forum (of course, by clicking on the Forum tab - and please notice that over there we also have an area with content in Spanish, German, French, Italian, and Portuguese). You might also consider the purchase of our book "Opera Lively - The Interviews" - full announcement and links to sales points [here]. Bookmark our site and come back for more - several new and exciting interviews are always coming to Opera Lively - next is tenor Giuseppe Filianoti.